Despite a very bland name the movie is a must see. Reluctantly I went to the screening at Annecy this summer and was blown away. 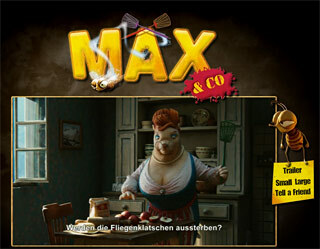 Cinemagination‘s “Max and Co” is a funny stop motion feature made in Switzerland which I recommend you to see. There is a finally a trailer online so run! I might come back to this post and elaborate a bit in the next few days but I was reading some stats on Boxofficemojo.com the other day and started to think that we might be on our way to a down market in the Feature Animation industry. Everytime I hear Brad Bird screaming “Story, story, story!” I believe he knows what he is talking about but without the heavy Disney marketing and the all time low dollar I am sure the movie would have tanked! Despite the critics unanimously calling Ratatouille, the best Pixar, I must admit that I got bored watching it and that s probably what the word of mouth was, boring. Just like me I think that people care more about entertainment than Story or how else do you explain Shrek3 results? Surf’s UP… Has anyone seen the movie? okay the story was a bit predictable but I still found it very entertaining. Animation was great, rendering was great, character design was great so how do you explain the $120m? The penguins? People didn’t want to see an other penguin story? I don’t think so. “Surf’s UP”, according to Rotten Tomatoes is this week’s number one rental at $8 million. If it wasn’t for Shrek endless success could we call this the end of Feature animation and the rise of the DVD market? just a quick post to say that I am still alive. I am getting used to my new life in the country side. I still haven’t found a proper gym and started to put on weight….. nooooo gooooodddd ;-) Working at Rare is awesome and everyone is fantastic. I haven’t done any personal work for the past few weeks but once my computer is setup I hope to be polishing my showreel and do some new animation.